Using Google Drive is very easy and is open to anyone with a Google account. Google’s Drive service is an extremely useful tool for cloud storage. If you don’t plan to use the online service or Google Drive mobile app, you can still make use of Google Drive on your computer. To get the Google Drive application (also known as Google Backup and Sync) for your computer, simply navigate to Google.com/drive from any web browser to download the software. The Google Drive download page is a smart page and will recognize what operating system (OS) you are using. As a result, the page will link you to the appropriate version supported by your computer setup. With any of the Google Drive computer application versions, a folder is placed on your local hard drive that syncs with your Google Drive account. Inside this folder you can view the contents of your Google Drive. The Windows Google Drive folder is located in Windows File Explorer. To find the Mac Google Drive folder, you will need to look in Finder. 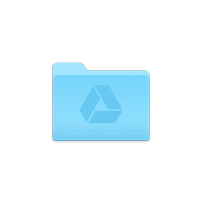 The Linux Google Drive folder will be placed in the Linux system file manager. 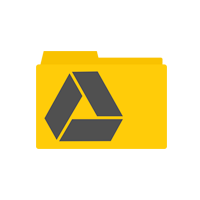 Simply drag and drop any file to the Google Drive folder to upload a copy to the cloud. Remove any file or folder from the Google Drive folder to delete items from the cloud. Right click, Ctrl+click, or long press items in the folder to initialize a pop-out menu and choose Google Drive → Share… to share the files in your Google Drive folder with others. Because Google Drive is more of a folder than an actual application, the background processes and settings must be accessed through the OS notification tray. On Windows computers, the notification tray is located on the task bar in the bottom right corner. If you are using a Mac, the notifications tray is in the menu bar in the top right corner. On most flavors of Linux, the notifications tray is located in the menu bar (global menu) in the top right corner. 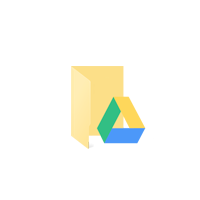 Seek out the Google Drive icon (older versions) or Backup and Sync icon in your notification tray and click or tap to adjust your Google Drive sync options, preferences, and settings.